On March 2, 2012, The Arts Center will be hosting their grand benefit called Chocolate Fantasy. Yes,with chocolate in the title, who wouldn’t want to attend? They have also roped in basketball coach Craig Robinson ( that’s Michelle Obama’s brother for those outside the area) who will be helping MC the event. Besides the culinary chocolate creations and rubbing shoulders with famous people, there are copious amounts of things to bid on and a gallery area where work can be purchased at full price. I was asked many months ago to contribute a work in the $300 range. Since I’m not a huge producer, I don’t just have something laying around like more established artists do. Especially in that price range. I chose to create a smaller format version of “A Walk in the Woods”. Here is the progress from this past week & Saturday. 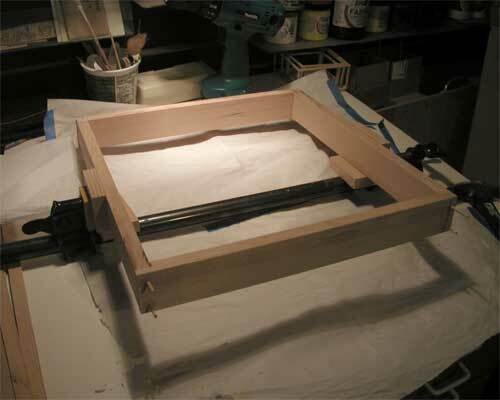 Sunday I should be able to sand, stain & finish the hemlock frame. From looking at my diagonal measurements it might actually be square! 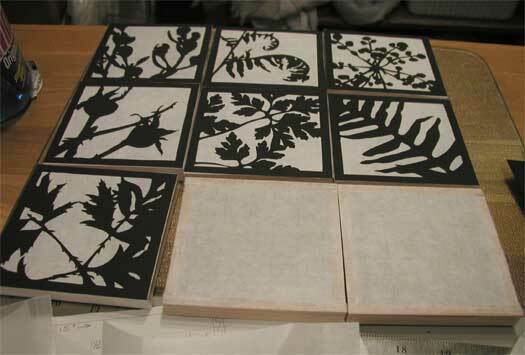 Only one more silhouette to cut and then the two to frame. Then there is the hanging of the smaller frames inside the larger. Whew, maybe I’ll actually be done by Monday morning!!! But I’m not holding my breath. 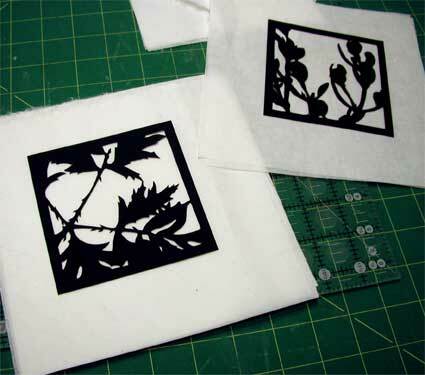 A note about the paper cutting: I’m using black Canson paper for the silhouettes and cutting them directly on a glass plate. 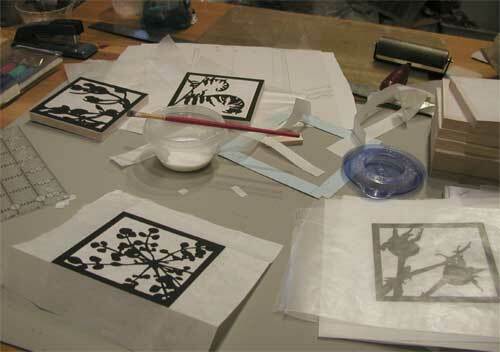 The glass allows for easier cutting. Also, I switch blades after 2 completed silhouettes. Better to be sharp than sorry! And not a single paper or blade cut on my hands. 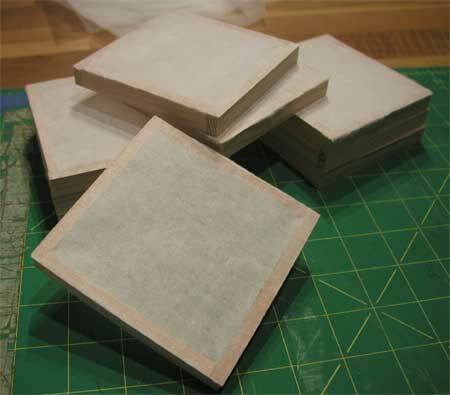 However, the tight cutting isn’t something my hands can sustain for more than 2 hrs a day (that’s only two squares completed depending on the design). Anything for the the worthy cause of chocolate. 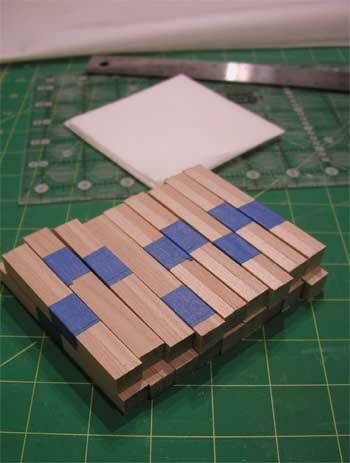 Just depends on the square & how intricate the cuts are… 3.5″x 3.5″ doesn’t allow for lots of free flowing curves. Some take over an hour including image transfer. My hands & wrists hurt today. You know my dear friend, time is money so when figuring out your donation value, please don’t forget to include that into your factoring. With that said, I’m excited to see how it turns out! Ah, yes, time & money. Interestingly enough, this is a 100% donation on my part. If it sells, then it’s gone. If it doesn’t sell… then it comes back home to venture out into other venues. Not certain which way I want it to go.